The giveaway is OPEN INTERNATIONALLY and the winner will be chosen randomly. This giveaway will be closed on April 20th, 2012 and I'll announce the winner on April 21st, 2012. 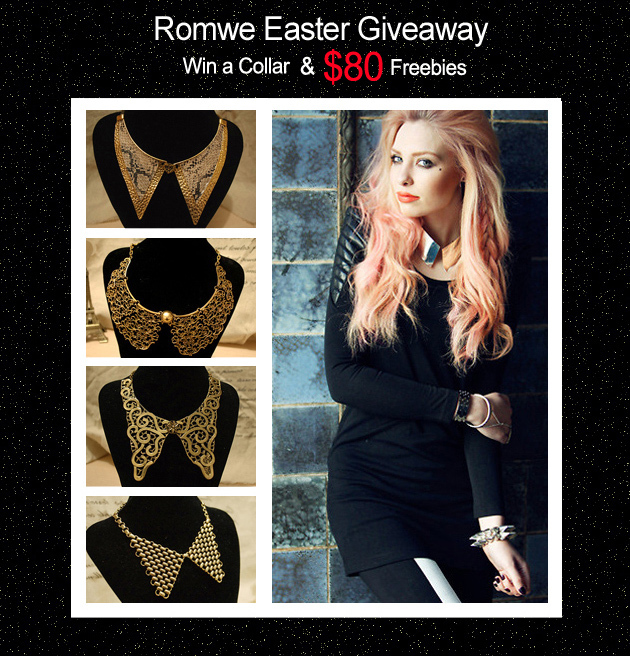 I never enter giveaways coz I am not very lucky in this kinda things but I really don't wanna let go of this giveaway firstly coz I have been following your blog for so long and I never miss any of your posts and secondly because it is my dream to buy something from Romwe but it is too expensive. & here I comment ! Wow, this really is a great giveaway! Aiiiiia, i want the collar. Happy easter! You are so pretty, love your style!